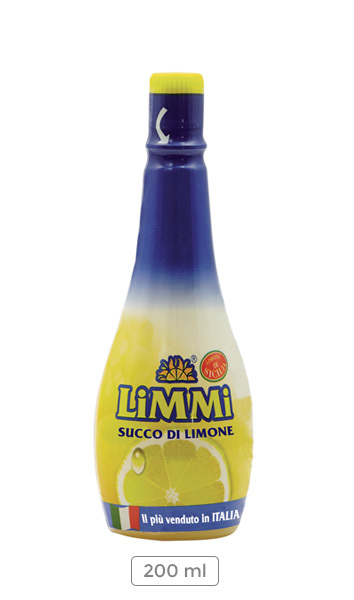 Limmi lemon juice is made from freshly squeezed Sicilian lemons, the very best in the world. They are carefully selected from prized cultivars and harvested only when fully ripened and at the peak of their flavour, sometime between December and June. Limmi packages its juice in bright, easy to see containers equipped with a liner specifically designed to protect the product from environmental agents and tampering. The neck of each bottle is fitted with a special capsule containing essential lemon oil. The tiny dose released upon each use gives the product its distinctive fresh citrus aroma. The secret behind its ease of use lies in the bottle itself: real juice from 8-10 lemons, ready to use and most importantly seeds free. Unlike lemons, Limmi lemon juice will last a long time in the fridge, and retain its freshness and flavour even after the bottle has been opened. Limmi is truly a kitchen “staple”, always at your fingertips and ready to enhance the taste and aroma of any type of dish. A splash of freshness and goodness, rich in calcium, potassium, magnesium, vitamins C, B1 and B2, readily available in the 125 ml size ( the juice of 3-4 lemons), 200 ml size (the juice of 8-10 lemons), and a 500 ml size (the juice of 18-20 lemons). 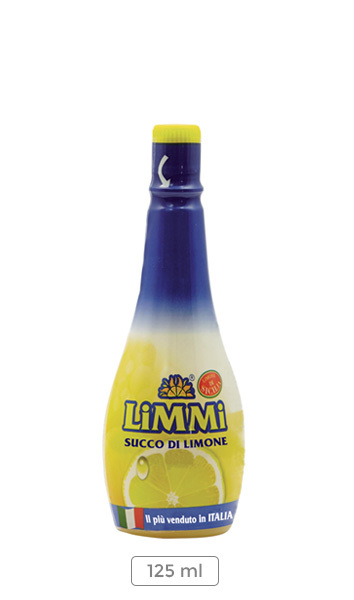 Limmi lemon juice in itself is extremely useful as a condiment to brighten up the flavour of first, second courses, salads and desserts, but can also be used to create gourmet dressings and sauces. It is excellent in fruit salads, with strawberries, hot camomile or traditional tea. Try one of our recipes! The practical PET containers used for packaging were specially designed to be light, easy to handle, readily recyclable and most of all guarantee the long shelf life of the product. PET is in fact one of the few materials capable of preserving the original organoleptic characteristics of products for the long-term. 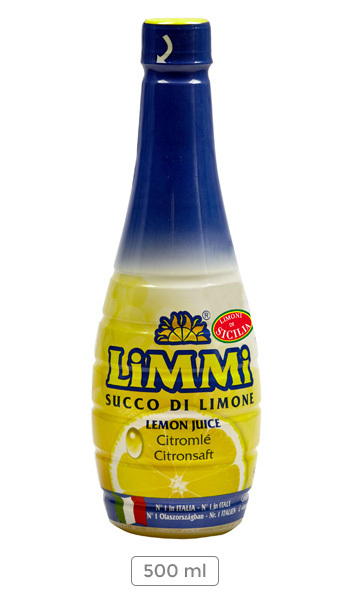 Limmi: Sicilian lemons, always fresh and right in you fridge!